Construction payroll is a complex environment that forces many contractors to avoid government work or outsource processing to a third party service. But Construction Partner Payroll takes the pain out of payroll processing by simplifying and automating even your most complicated calculations. From a single screen, record employee time, equipment hours, service work and more. (Or import your data from a spreadsheet or third party program like JobClock.) 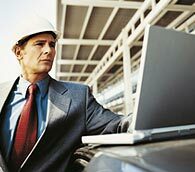 Construction Partner calculates things like taxes, union benefits, pre-tax deductions and burdens. Need a Certified Payroll report with a Statement of Compliance? Need a Workers' Compensation report for an audit? Need a Job Costing report that includes every penny of labor spent on a task? Just select and print. Construction Partner really makes payroll processing that easy! Click here to schedule a 1-on-1 demo of Construction Partner’s Payroll features.